& licensed to let horses. Dorcas Howard died 10th November 1854 and according to her will, the house was to be sold and the proceeds divided between her 7 children. 16thC building with 18thC frontage. Elizabeth Banyard, widow, announced 3rd June 1779 that she was to continue at the Inn. All those indebted to the late Charles Banyard were requested to settle their accounts. 22nd September 1804 - Robert Roper thanked the Nobility, Gentry and Others who had honoured him with their favours during the life of Mrs Roper and informed them that he intended to carry on at the Inn. Offered for sale in 1804 with barn, stables, coach-house, yards, garden & bowling green. A meeting was held here c1812 for people with common rights to make their claims to the Enclosure Commissioners. Mr. Howard offered a handsome reward for the return of his Greyhound Dog, answering to the name Duke, lost on Saturday 23rd September 1820. Whoever detained the dog after the notice to be prosecuted. A meeting in 1830 resolved to raise a pack of fox hounds and to encourage landowners to conserve foxes. 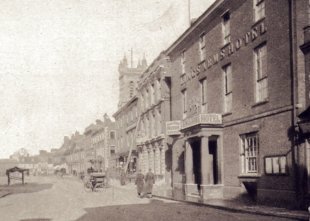 In 1830 a coach called the RISING SUN stopped every Tuesday, Thursday and Saturday at 5:00pm on route from Norwich to Kings Lynn The UNION called every Monday morning at 8:00am on the way from Norwich to Stamford. As Hotel & Excise office 1836. Charles Howard assigned all his Personal Estate and Effects to three Trustees for Equal Benefit of his Creditors in an Indenture dated 12th February 1840. Charles Howard provided a sumptuous dinner for about eighty gentlemen who had assembled at the house on Friday 20th January 1843, to celebrate the birthday of the Right Honourable Lord Sondes. For Sale by Auction Friday 6th January 1843. Mr. Charles Howard in occupation until Michaelmas 1843. Mrs. Dorcas Howard, widow of the late William Howard, advised 30th March 1843 that she had taken over the Inn. A dinner was held here Monday 15th February 1847 to mark the arrival of the first passenger train to Dereham. Offered for Sale by Auction Wednesday 2nd May 1855 by the Executors of the late Mrs. Howard. The front having been built within the previous 26 years. In occupation of John King at a rent of £200 per annum. For Sale by Auction July 1856 upon the instructions of the Trustee of the Will of Mrs. Dorcas Howard, deceased. Then in still occupation of Mr. John King who would give up possession at Michaelmas. For Sale by Auction Friday 29th July 1859. Containing a spacious Entrance, Commercial-room, Porter-room, Bar, Kitchen, Pantry, Scullery, Larder and Tap-room. Two excellent Dining-rooms, forming when required, one room 47ft by 16ft, two upper Sitting-rooms, sixteen Bed-rooms and a Water-closet, four Wine and Beer Cellars and a spacious Yard. A range of Knife, Shoe, Coal and Corn Houses, extensive Stabling and Coach-houses, Corn Granaries, walled in Yard, Barn and Cow Houses also large Kitchen Garden and excellent Bowling Green. The only Posting House in Town or surrounding area. In occupation of Mr. John King until Michaelmas 1859. September 1859 - For sale or to be let with possession from 10th October 1859. Purchased Friday 27th May 1870 by plumber Matthew Carter for the sum of £3200. He outbid his brother Richard Carter, landlord of the DUKES HEAD. For Sale by Auction August 1881.
with seven Sitting-rooms, twenty Bed-rooms and Billiard-room. A Freehold Estate occupying 1A 1R 26P. Given as Commercial & Family Hotel & Posting House. As well as Fire Alarm station.